Hypnotic and meditative, 'NYX' waxes and wanes around thirteen slow-motion tracks encompassing depth and air. Each track is centered on a fixed tonal structure, recurring sounds and themes appearing throughout giving an overall coherent sound to the album. Spatial and spectral processes add to the subtle colour of the work. In terms of spectral balance, 'NYX' has a tempered upper frequency range, resulting in a softer sound than is usually present in ambient music. For this release, I felt that less was more and focusing on a somewhat band-limited spectra allowed for a more tempered overall production. The album is 'long-form' in terms of its overall duration - it's a 'single' album of just over 2 hours in length. 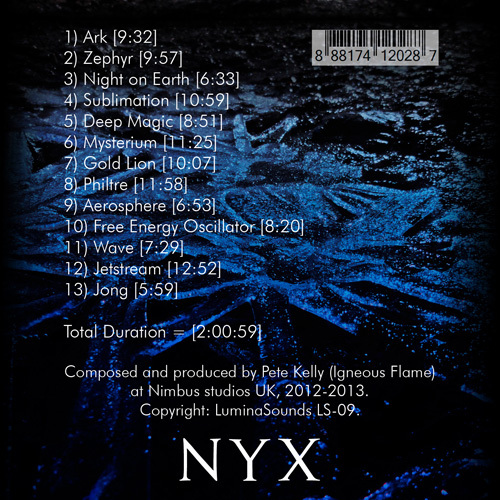 In the traditional sense of defining an album by what can be fitted on a CD, it would be a 'double' album, but as 'NYX' is a digital only release, there's no requirement to define it as such. CD Baby page will be 'live' soon - both these sites are the cheapest place to get the album. Excellent review of 'NYX' on the 'Make your own Taste' blog. I don't say that just because it's a very positive review of the album, it's because I think it's very well observed as well. Philip Wilkerson album 'Sojourner' reviewed also. "Igneous Flame’s NYX is a very generous helping of ambient indeed, clocking in at over hours, and is best digested in a single large helping, if possible. I’ve used it for meditation purposes about ten times, had it on while working, and also sat staring into space absorbing the little nuances on offer. And I conclude that this is not just really good, it’s totally effing good in every way. I’ve pointed out before that the differences between “meh”, workmanlike ambient and really good, thoughtful and carefully crafted ambient can be subtle." I'm very pleased that HoS are playing two of my tracks from 'NYX' on their current show. After ten years of releasing my music, it's always exciting to get HoS airplay. For me, doing my subtle and idiosyncratic thing here in the UK, it means a lot ! PGM 1019 : "OCEANIC REALMS"
Bravo Pete.......very excited for you! I'll third that one. Congratulations, Pete!